Damon Herriman stars in PERPETUAL GRACE, LTD. as “Paul Allen Brown,” the wayward son of Ma and Pa (Jacki Weaver and Sir Ben Kingsley) and the architect of the scheme to fleece his own parents out of millions. But when his new partner in the plan, James, assumes Paul’s identity as designed, we learn James may or may not be assuming the identity of a psychopath. 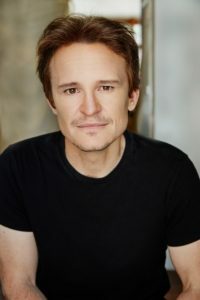 Damon Herriman began his acting career over 25 years ago and began acting at the age of eight. He worked extensively in television as a child in shows like The Sullivans, SaraDane, The Flying Doctors and For the Term of His Natural Life. His background also includes directing and award-winning script writing (multiple Tropfest winner, Australia). At 18 he moved to Sydney and has continued a successful acting career in film, theatre and television. He has worked with all the major theatre companies, including the Sydney Theatre Company, Belvoir Street, the Ensemble and the Griffin. His television credits include Water Rats, All Saints, Murder Call, Brides of Christ, GP, O’Loghlin on Saturday Night, Elly and Jools, and the recent remake of South Pacific with Glenn Close and Harry Connick Jr. He has appeared in the films, The Big Steal, Praise and plays one of the Kelly gang in the new comedy released in 2003, Ned. At ages 10 and 11 he was nominated for Australia’s equivalent to the Emmys for his performance in The Sullivans. Since then he has worked extensively in film, television and theatre. His Australian film credits include The Square, Candy, Ned, Praise, The Big Steal and most recently the lead role in 100 Bloody Acres. On Australian television he is best known for the acclaimed series Love My Way. He also played The Professor in the US remake of South Pacific, which was filmed entirely in Australia.He has worked many times with the prestigious Sydney Theatre Company (run by Cate Blanchett), most recently in Tot Mom, written and directed by Steven Soderbergh. In 2004 Damon scored a role in the US horror film House of Wax (shot in Queensland, Australia). After attending the premiere in Los Angeles in 2005, he began a career in the States. Damon has since appeared in Clint Eastwood’s J. Edgar, Disney’s The Lone Ranger, and the David Mamet helmed feature, Redbelt. He also appeared in the Ewan McGregor feature Son of a Gun, as well as the award-winning feature The Water Diviner, directed by Russell Crowe. Damon was one of the stars of The Little Death, which opened to rave reviews, and won the audience award at SXSW. Damon starred in the feature Down Under, for which he was nominated for both the AACTA Award and the FCCA award. Damon was also in The Nightingale with multi-award-winning director Jennifer Kent, which won the Special Jury Prize at the 2018 Venice Film Festival, and will be featured in the 2019 Sundance Film Festival. Damon stars opposite Mia Wasikowska in the upcoming feature Judy and Punch, which will also be in the 2019 Sundance Film Festival. Damon recently played the role of Charles Manson in the upcoming Quentin Tarantino film Once Upon a Time in Hollywood. On television, Damon is currently shooting the new Epix series Perpetual Grace, LTD. opposite Ben Kingsley and Jackie Weaver. He will also be in season 2 of the acclaimed Netflix series Mindhunter, playing Charles Manson. Damon was in the international hit series Top of the Lake: China Girl, and the critically acclaimed Cinemax series Quarry. Damon starred in the limited series Secret City, for which he won a Logie award. He was also one of the leads of the Starz limited series Flesh and Bone and recurred on the Vince Gilligan/David Shore series Battle Creek for CBS. He has also appeared in many other series including the hit AMC drama Breaking Bad as well as the FX comedy Wilfred. He is well-known in the US for the recurring role of Dewey Crowe in the critically acclaimed FX series, Justified.